Boehner didn’t get his wish of passing such a bill before the election. But he’s about to become Speaker of the House, and starting in January, it’ll be a whole lot easier to get his way. With common-sense exceptions for seniors, veterans, and our troops, we will roll back government spending to prestimulus, pre-bailout levels, saving us at least $100 billion in the first year alone and putting us on a path to begin paying down the debt, balancing the budget, and ending the spending spree in Washington that threatens our children’s future. In 2008 – the year Boehner mentioned to George Stephanopoulos – transportation spending levels were $41.6 billion for highways and $9.7 billion for transit. The TIGER program didn’t exist yet in 2008. High speed rail funding – already considered a likely first target for cuts – would be a goner for sure. Besides, if the Republicans want to roll spending levels back to 2008, they’re still going to be trapped in deficit spending. Schank says Rep. John Mica, the incoming Transportation Committee chair, doesn’t consider that kind of deficit spending viable. Further, the 2008 transportation budget included earmarks. If the Republicans follow through with their earmark ban as promised, Schank said, “there’s going to be money flying around” to be used some other way. 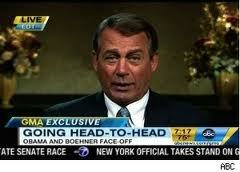 Boehner doesn’t seem to understand that you can “put certainty in the economy” without destroying it. Why save $100 billion if you’re just going to turn around and spend $900 billion in tax cuts? @JJJ: are you really asking this? Q. What is the economic stimulus package? A. Officially known as the American Recovery and Reinvestment Act, this bill was signed into law by President Obama on February 17, 2009 to provide financial relief for a severely weakened U.S. economy. The bill offers several tax-cutting and Federal investment measures, including a provision to increase the transit benefit cap from its current $120 a month limit to $230. By providing these additional tax savings, commuters can recoup up to $1,000 or more a year in tax-free savings for the necessary cost of travel to and from the workplace. And by placing this transit limit on the same level as the current parking benefit limit, the more attractive incentive to choose transit as a mode of transportation over driving could reduce traffic congestion and improve air quality, which is the environmental value of this benefit. Q. When does the new pretax amount for transit benefits go into effect? A. The new law goes into effect for the February benefit month or as of February 1, 2009. If you distribute benefits directly to your employees at the workplace you may begin ordering TransitChek benefit products at the new cap level starting today using the TransitChek Order Form. If benefits are provided directly to your employees through the TransitChek Premium program via mail or electronic funding, specific instructions will be provided by TransitCenter to help you adjust your program to the new levels as quickly as possible. Employees can receive their benefit at the new level for use on June 1, 2009. Q. What is the maximum my employees can deduct? A. The new Federal limit allows your employees to deduct up to $230 a month of pretax salary to pay for transit and vanpool commuting expenses and $230 a month for commuter parking. Want to save us some money? Get us out of Iraq and Afganistan!! These wars were based largely upon the ridiculous premise that it is possible to convert predominently Muslim countires into democracies, which it clearly isn’t. If Iraq were a legitimate democracy, the Christian population in the Middle East would be migrating to that country instead of fleeing from it by the hundreds of thousands, and it wouldn’t have Sharia Law incorporated into its constitution, which it does. These wars have been a collosal waste of money and lives, started by a president (Bush) who in his youth used the National Guard to dodge having to go to Vietnam. But that’s appropriate. The biggest supporters of these wars are neo-conservatives, few of whom actually volunteer to go and fight themselves. How Hard Will the Senate Fight Back Against House Spending Cuts?